Our first year full-timing in a motorhome – how much did it cost? 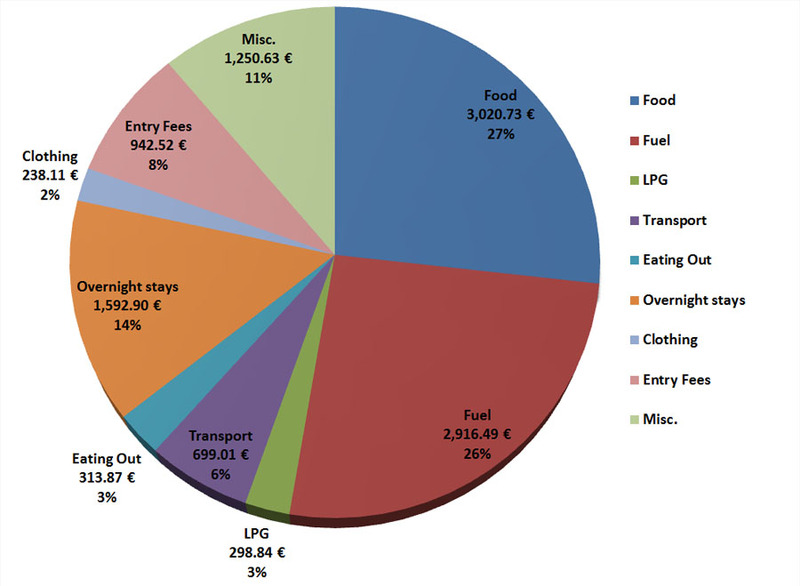 Here’s a look at the costs, annual and daily, associated with our chosen lifestyle choice. It’s been a full year now since we took the plunge, leaving our professions, friends and family behind for life on the road. We thought it might be useful to others who may be considering a similar lifestyle change to see, for their planning purposes, how much we’ve spent over a full year, and on what. Of course, what we’re happy with on the road may not suit you, and vice versa, so we should say first that our spending levels are absolutely personal to us. Our costs are at a level we’re comfortable with, and they suit our current financial situation; but everyone is different. If required it would be possible to live on much less, with patience and frugality. And it would certainly be very easy to spend much more too, if eating out, guided trips and expensive attractions are what interest you on your travels. We like cooking, so eating out only very occasionally is fine for us. Most of what we really enjoy doing is free, like hiking in the mountains, wild swimming, cycling off-road or running trails. The one big exception to this is skiing, which is definitely an expensive week (or two) whatever way you look at it, even if bringing your own accommodation helps reduce the costs a little. We like seeing cultural sites too, but we’ve learned to be selective, as paying into every church, museum, fort, gallery or other attraction we pass would be exorbitant. We have occasionally volunteered our time at WorkAway projects and these social, volunteer efforts offer a variation that invigorates us, offers a welcome change of scene and keeps our costs for that time at a minimum. We also have a few winter house-sits coming up which will enable us to live a more rooted, normal life for a time, and allow a more detailed exploration of specific portions of rural France. 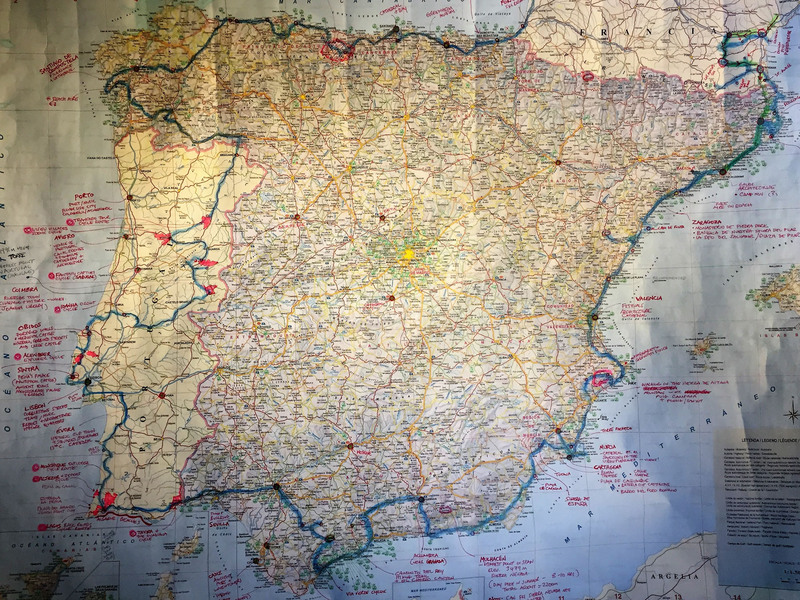 Our travels during our first year were split into two long trips of roughly six months (France, Spain & Portugal) and five months (Northern Europe and Scandinavia) respectively. We had a month or so in between where we returned to the UK for servicing, maintenance and a catch-up with friends and family. We sneaked in a quick two week trip to Scotland (no map) during this time too. 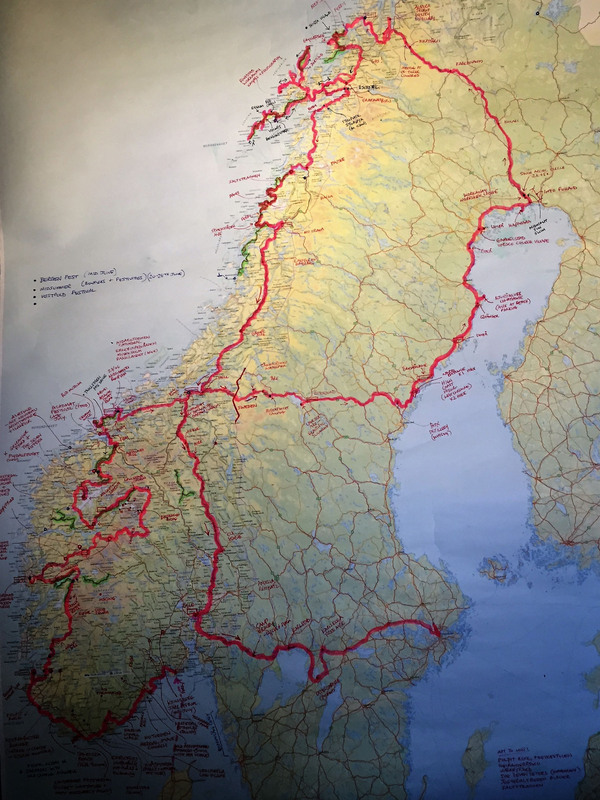 The Scandinavia trip is still on-going as our ‘one year on the road’ anniversary has fallen mid-travels. 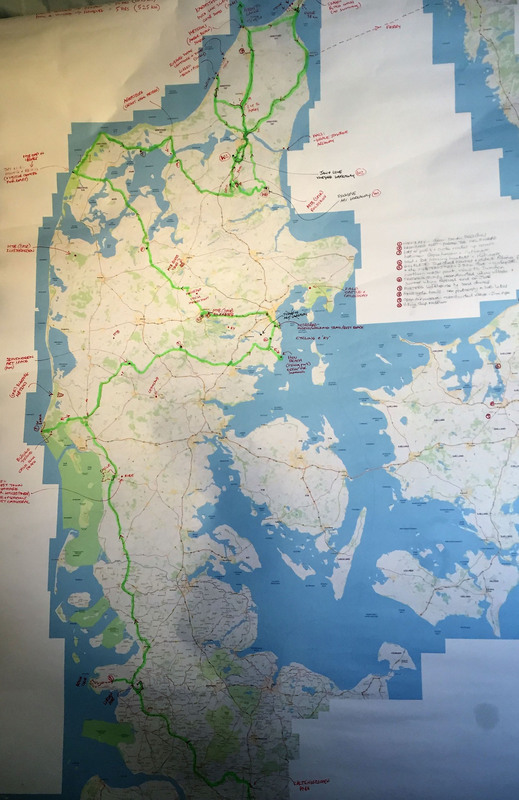 We have tracked all our costs and distances as we travelled, noting down spending and mileage counts at driver changes or stops as they occurred. We added these to a bespoke spreadsheet set up to record, count and analyse our activities month by month and county by country. Synopsis tabs with some complex formula then collate each category into, hopefully, easy to understand tables or charts, for a quick overview. Yes, indeed we do have too much time on our hands. This doesn’t include purchasing our Benny (a new Benimar Mileo 201) in the first instance, so the cost of your chosen van, whether new or used, should also be factored in here. All our ferry costs to and from mainland Europe, or within each country are included within the daily cost totals under the category ‘transport’. We tracked everything in euros, as this was the predominant currency of our first six months and it made sense to continue with the same base. All Scandinavian currency spends were recorded in euros at a fixed exchange rate, that of what it was when we first entered the country, so there may have been some fluctuation in value during our time (in either direction) that we didn’t capture. 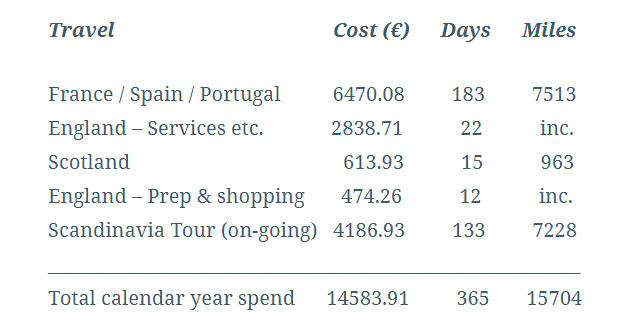 This equates to (at current exchange rates) an approximate spend of £13354.00 for our first year travelling in Europe, or an average spend of £36.59 per day, all in for us both. ENTRY FEES– Entry fees for museums, galleries, castles, cathedrals and other events etc.. If we removed all the up-front facilitating costs and only looked at expenditure on the road, we are spending under €950, or £870, per month, and for the incredible experiences we’re having and the beautiful places we are seeing, this seems like a very good deal to us – long may it continue. This entry was posted in 2017 Scandinavia Tour, Finances, France, Germany, Netherlands, Norway, Our First Six Months, Our Travel Journal, Portugal, Scotland, Skiing, Spain, Sweden and tagged analysis, annual, budget, Finances, motorhome costs, route, route maps, spending, spreadsheet, travel costs on Sep 4, 2017 by Aaron Hill. 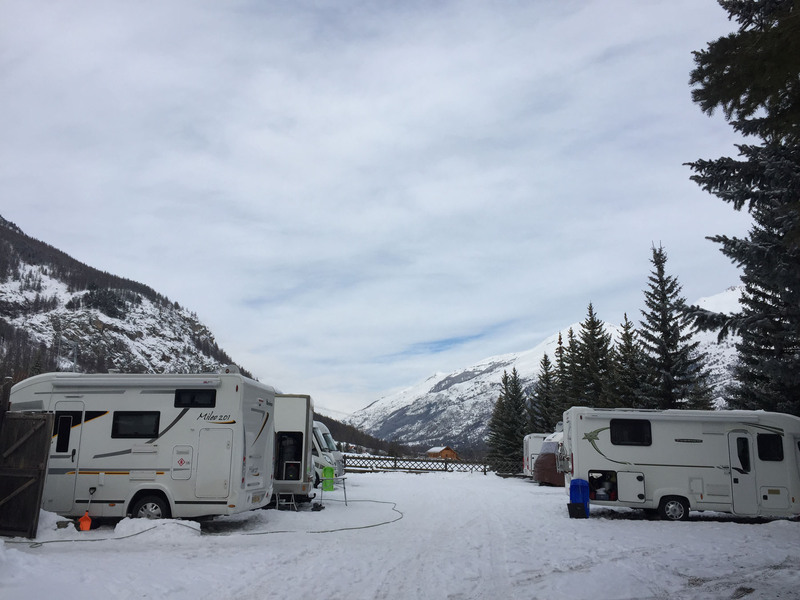 Our base for the week was a private campsite aire in the heart of the village of Villeneuve, the most central of the four key villages that provided direct lift access to the expansive ski area of Serre Chevalier. Due to overnighting just down the valley in Briançon, we arrived on site much earlier than expected. With us perhaps a little too eager to get settled in, we phoned the owners of the site and dragged them out to greet us and to agree which plot suited their scheduling plans best. We got a corner plot near the entrance, only thirty metres or so from the main ski lift, and our short hose reached the service point taps from there, so all was well. We had some difficulty getting into the pitch as the site was layered with thick snow, compacted in many places to hard ice. The lady owner graciously helped us get manoeuvred in with the aid of rubber mats under our wheels and we surprisingly plopped into our snowy pitch perfectly level, with no chocks required. Perfect. This would be our longest stop on our 160 days of travels to date, seven nights in the same location, and we were excited to be stationary for such a long time. To make our little nest as comfortable as possible we scraped and shovelled snow and created a nice, level access path around Benny, to make our access and egress as simple as possible. 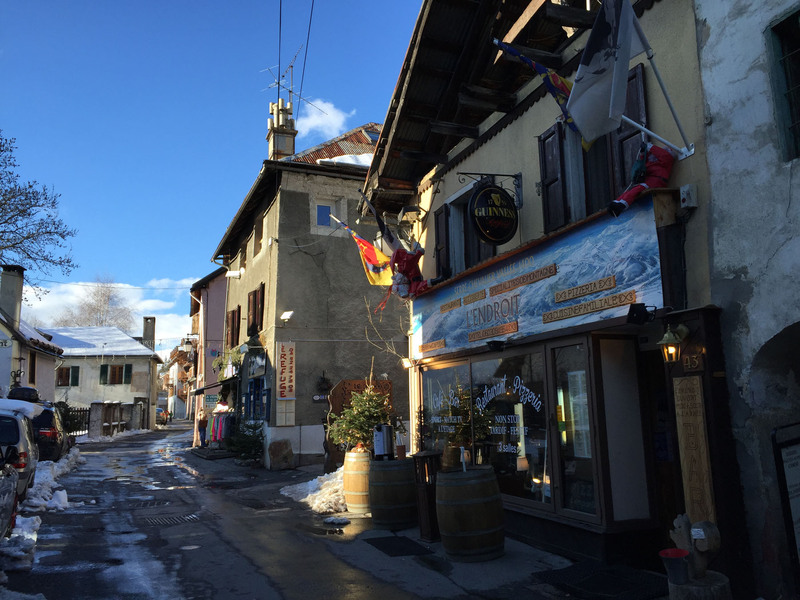 We had a leisurely afternoon walk around the village, where we bought our six-day lift passes to begin the following day, but had to return to the local hire shop the following morning to hire our skis and boots, before making our way to the slopes. It was a Saturday, the normal ski transition day when the race to reach the resort from local airports would be clogging up the roads, so we were glad to have already arrived and, even more fantastic, to have the lifts and slopes almost entirely to ourselves. 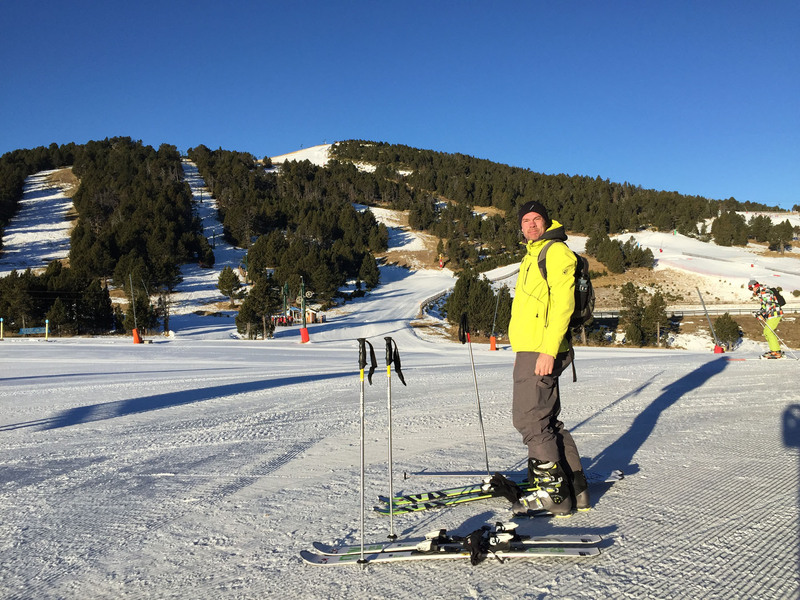 There were only a handful of other people on the newly groomed pistes, likely locals or perhaps chalet staff that had part of the day off until their new clients arrived. The sun was bright and the sky a deep, blinding blue, with light wispy clouds the only interruption. 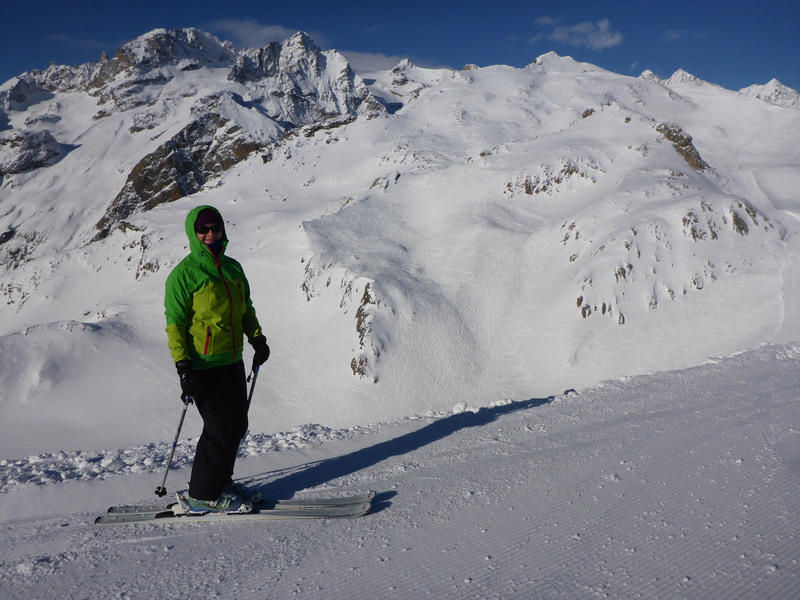 We decided to first explore the most distant stretches of the ski area, heading over towards Briançon, while both the weather was good and the crowds light. 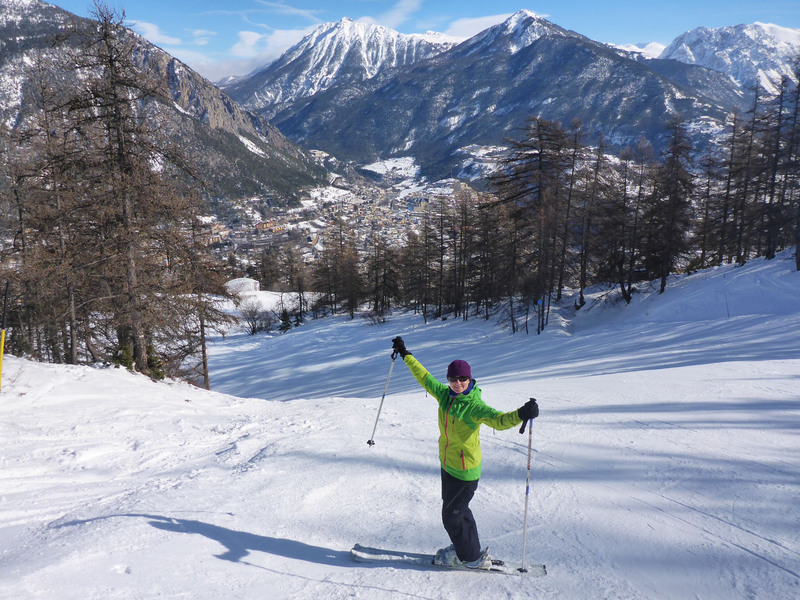 We enjoyed many empty, tree-lined runs back down into the town, and with no queues to delay our return back up we covered a lot of ground, rigorously testing our shaky ski-legs. The afternoon brought biting winds that gusted across the mountain tops, moving huge banks of newly-gathered cloud around like someone hurriedly rearranging plush grey cushions. We ate lunch in a BBQ stop near the top of the valley, with stunning views and the sun on our faces, relaxing into deckchairs in the only place we saw people congregate all day. After a hard morning and with the thought of five more full days to follow, we thought it best to make a move back home, to ensure we arrived back at Benny for 3.25pm, just in time to watch the Six Nations games on our laptop, with a few refreshing beers. The next day there were mottled clouds that rumbled across our view like giant icebergs in a rough, grey sea. We were suddenly very glad we’d had the beautiful Saturday, and we instantly noticed the difference as we queued for fifteen minutes for the first lift up. Once we reached a position a few lifts up from base the crowds thinned out and the pistes regained their wonderful openness. The dark clouds parted like giant curtains for short moments, letting the too-bright shafts of orange sunlight fall across us and the valley. The glowing solar heat on our faces was immediate as it instantly pushed aside the clawing fingers of the icy winds. We sought out the sunny patches as we skied, both to warm us and to allow us better visual contrast in the snowy white-on-white. On our third day skiing, we met up with friends from home, Jonathan and Fiona, along with their extended family. We skied over to meet them in Le Monétier-les-Bains, had a lovely lunch there before hitting the slopes with Jon and his brother-in-law Ben, a local Frenchman and expert skier. 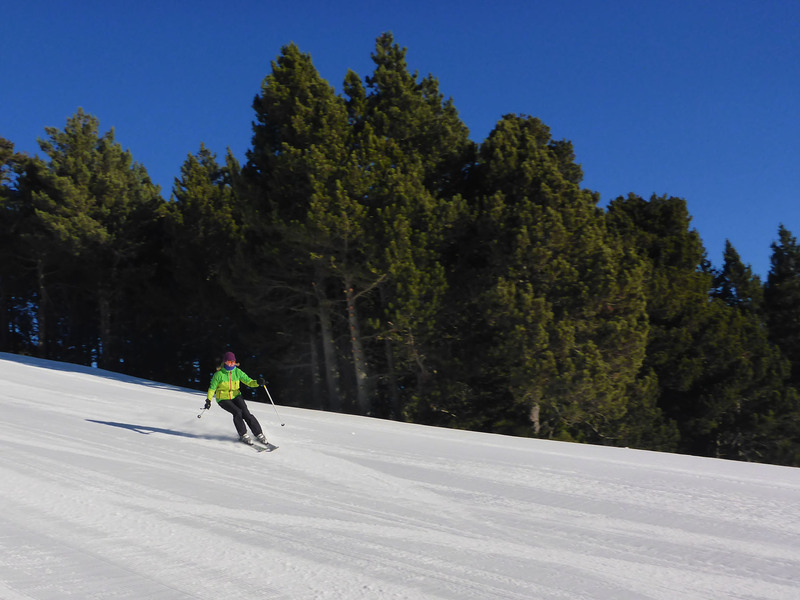 The dull, overcast morning transformed into another bright blue, sunny afternoon as we worked around the local ski area, enjoying the runs and catching up. 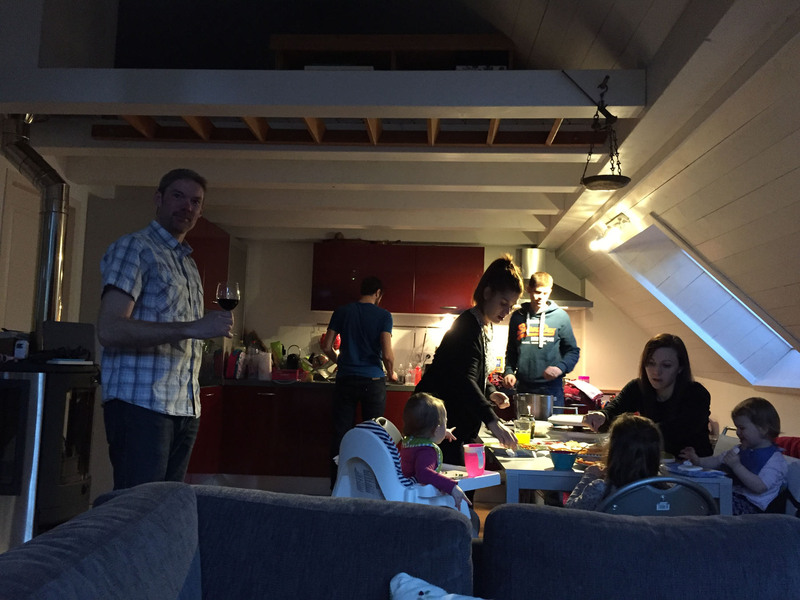 Later in the week we were invited to dinner back at theirs, a traditionally French raclette meal that we enjoyed with a tasty red. 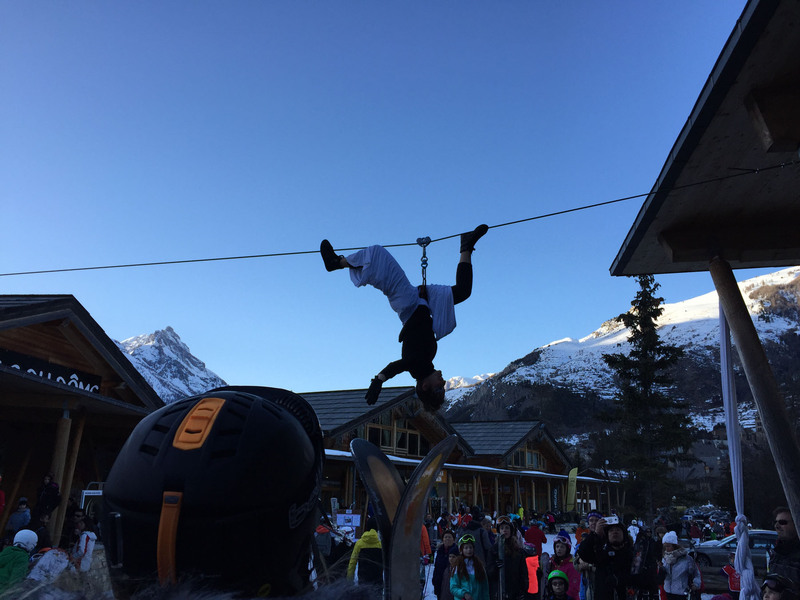 On the way over we viewed a small part of the ‘Serre Che‘ social entertainment programme, in this case an acrobat on a wire performing twists and turn for the skiers as they came off the slopes. After dusk had won its battle against the bright sunshine and toned down the brilliance of the white snowy slopes to a greyish moon-illuminated glow, from the advantaged position of the piste-facing dormer windows of Ben’s family home, we were all treated to a great view of the colourful, snaking descente aux flambeaux, night ski with torches, on the nearby slopes, followed by a spectacular firework display to round off the night; chapeau, Che. One glorious morning we chose a long black as our first run of the day, drawn to it as the piste was entirely empty as we passed over on the chairlift up. The run was beautifully tree-lined but almost bare; what little thin snow powder coating there had been having slid off the very steep face. It was, at times, like sliding down a wide sheet of ice, and holding enough of an edge to slow down progress on our turns was next to impossible. Our skis screeched and scraped on the compacted snow, like fingernails down a dusty blackboard. On several portions we had to simply accept our ever-increasing speed, straighten up and go, working our leg muscles very hard to hold our line, and nerve, until the piste levelled out a little. 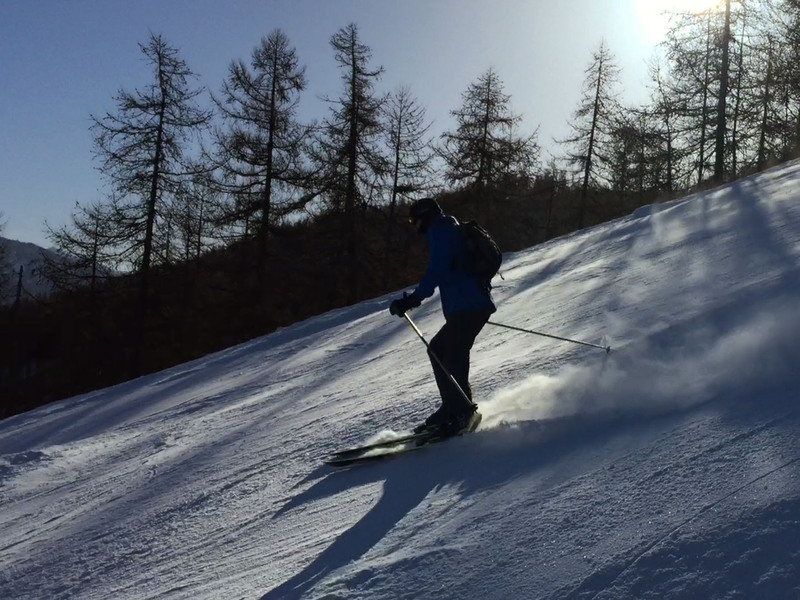 We reached 70km/hour on occasion, more as a practical necessity than a specific desire, but it was so exhilarating to have the run of a steep, smooth piste all to ourselves; an impeccable skiing experience. One afternoon we spent a fun hour playing in the Videozone area with the cool kids, where we caught a little air on jumps and had a few near falls, just holding the landing together in the less than elegant style of a flapping Frank Spencer. Unfortunately, the videos we set to record us, uniquely linked to our lift passes, did not appear on-line as promised, so we were a little disappointed not to be able to relive both the glory and embarrassment. 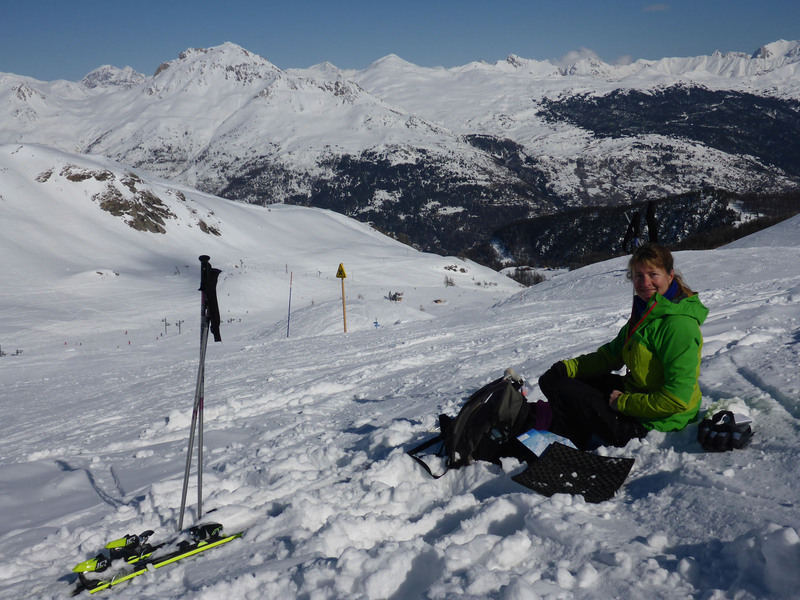 We skied each day from 9am until around 3.30pm, when our legs gave out and we had to return to rest. There was perfect powder coating on most higher altitude red runs, but there was some slushy ice with muddy stones coming through the sparse snow on the skinny green runs nearer to village level, especially so at the end of the week. 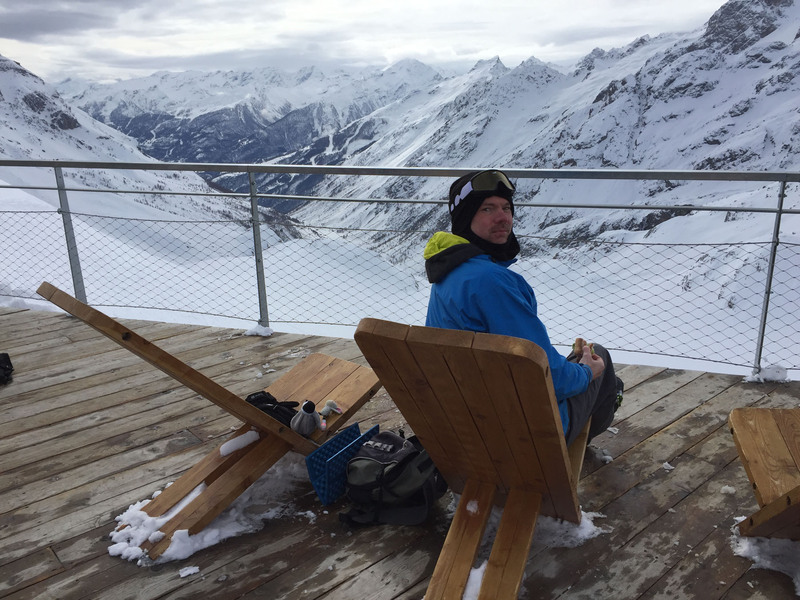 During the week we ate our lunch in five different points spread out across the mountain range, each with a different but special view, and once with Jonathan, Fiona and all the family in their apartment in Monétier. 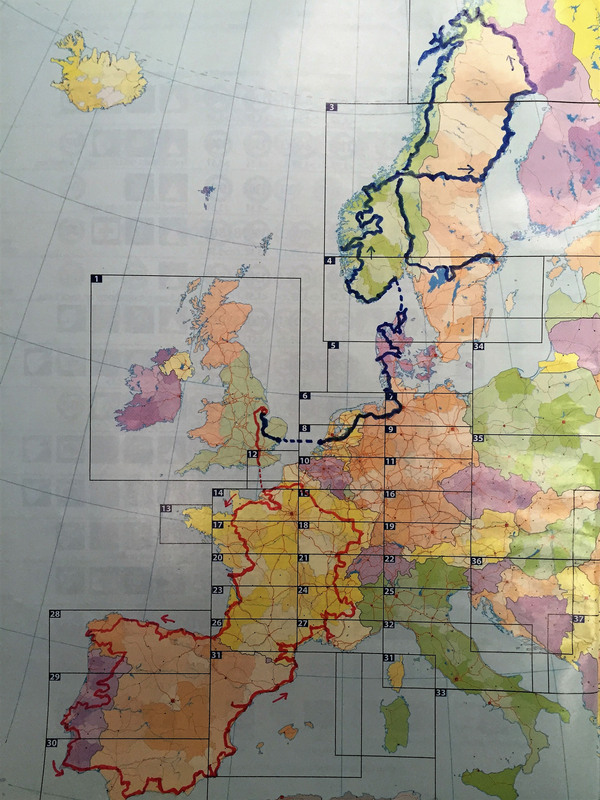 We coloured in the full piste map over the course of six days, with only a couple of high glacier blacks not attempted as the wide reds were just too much fun. 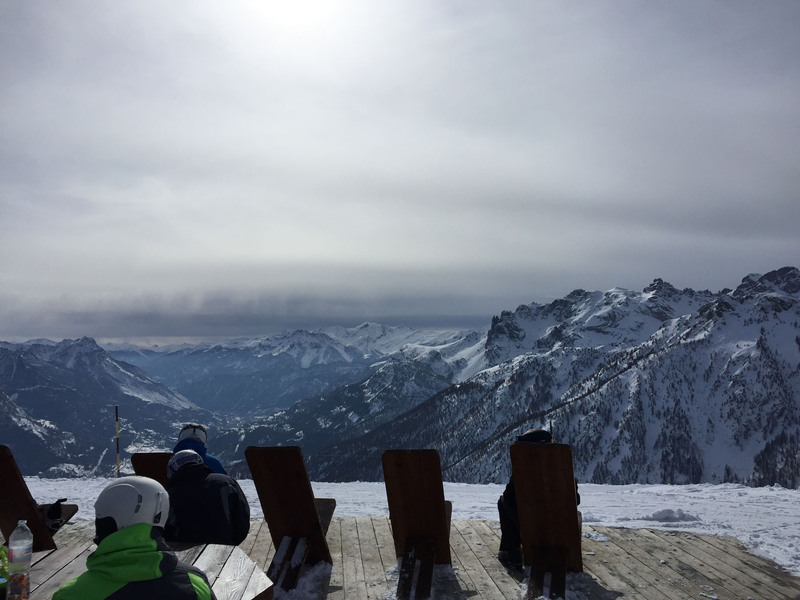 It was a fantastic week’s skiing, and catching up with friends, and despite the gruelling efforts of our leg muscles we felt nicely rested without the usual driving and planning we have to undertake each day in our ‘normal‘ life. But the road was calling us again. 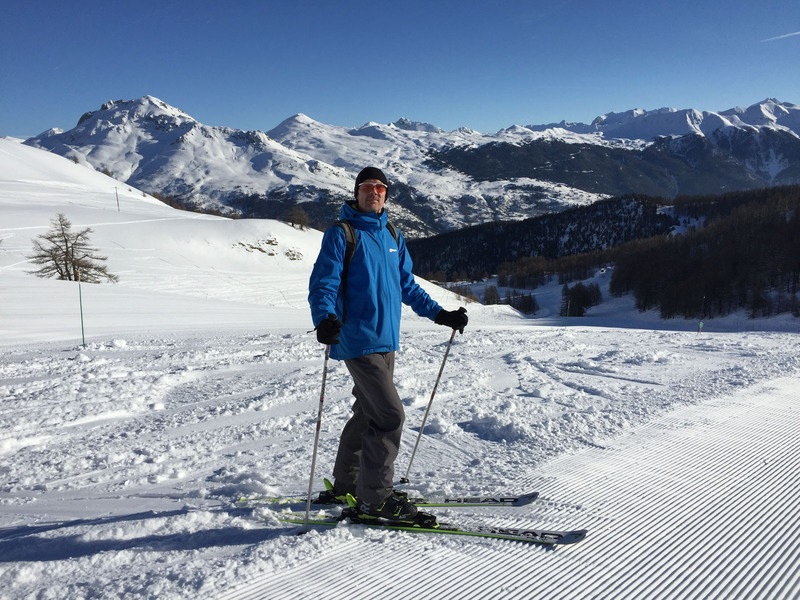 This entry was posted in France, In France, Our Travel Journal, Skiing on Feb 26, 2017 by Aaron Hill. Arriving back into France from the beautiful Costa Brava, we settled quickly into our village aire in the small town of Saint André. Really no more than a shared car-park on a quiet street, it was still quaintly comfortable and inviting, and somehow very French; we were happy to linger here, alongside the grey buildings and the badly parked cars. We had a slow afternoon, with most of the remainder of the day taken up with the mundane jobs of laundry and food shopping in the local Intermarché supermarket. We had a short walk around the village to stretch our legs and get a feel for a French village again, which was just interesting enough to lure us from the warm comforts of Benny. The next morning was clear, bright and cold; the weather was now becoming quite predictable. The air was crisp and cool, and hurt a little to breathe at first, but this was weather we knew how to dress for, especially when the day involved cycling. We got out our bikes, wrapped up and headed east towards the coast. 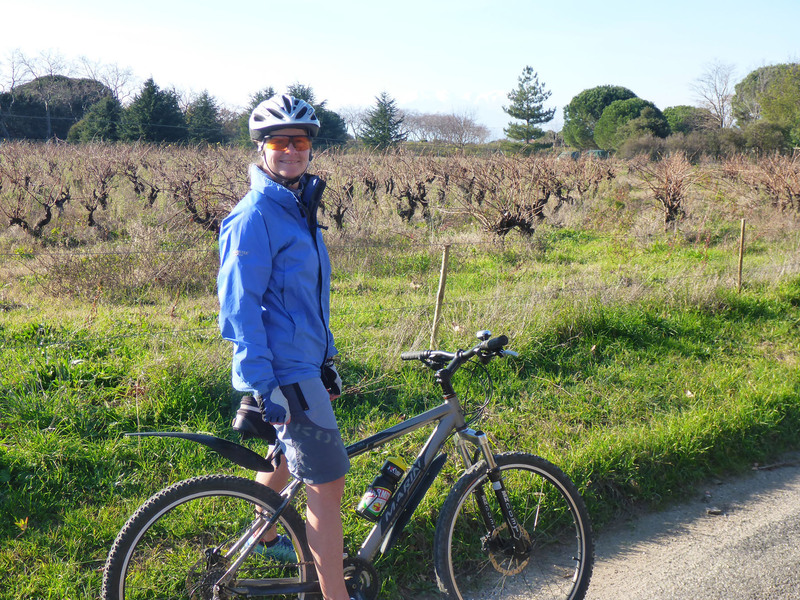 This was a smooth, easy rolling exploratory cycle to Argelès-sur-Mer on flat, quiet roads. The cycling required little effort, yet allowed us to explore much quicker and further afield than on foot. We first circled the town centre, looking up and down the little streets passing cafés and bars, before finding the local Tourist Office where we were given a lot of information to help plan our next moves in this region of France. Argelès was a quite lovely town with a great, relaxing feel to it, even when this far out of season; we took a liking to it instantly. 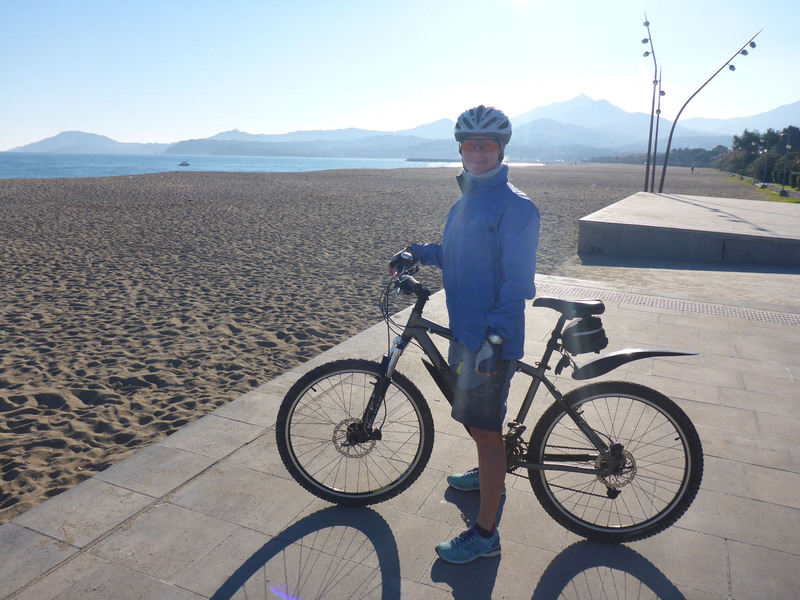 We cycled to the beach promenade on the south side of town, overlooking the stone harbour walls. We enjoyed beautiful views from the beach to the distant snowy peaks of the high Pyrenees, then almost calling out to us from afar. 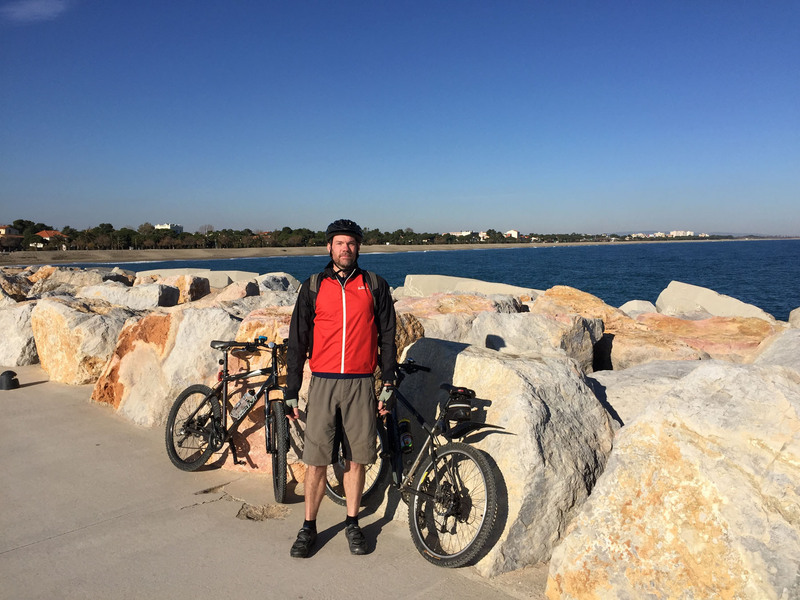 We rolled gently along the wide cycle lane running parallel to the expansive beach frontage for the full length of town, as far north as we could, before cutting back in and returning to the town centre by the empty roads. We covered over 20km without breaking a sweat, a nice way to feel we got some exercise and fresh air and to see the extents of the town. Our long term plan has always been to buy a small place in this region of France, to settle into a community and to use it as a base for future travels. We had always dreamed of finding our dream home somewhere equidistant from the coast and the high mountains, and convenient for airports. 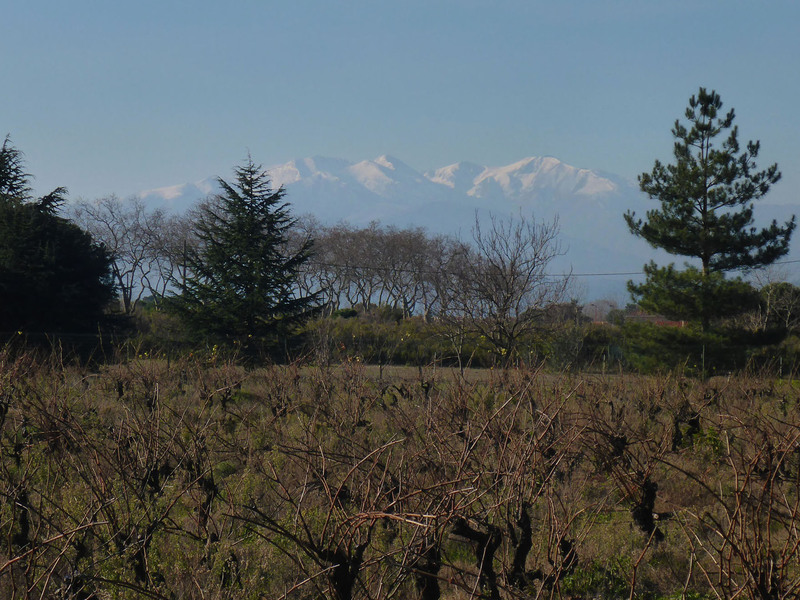 This was the first prime spot in the Languedoc area that we had visited, and although on the coast and far from the Pyrenees, it was certainly alive with many glorious possibilities for us putting down roots in future years; we have much to consider. We had a last wander around the centre of Saint André village, mostly to utilise the free WiFi we discovered at the town hall, before driving north to the outskirts of Perpignan. 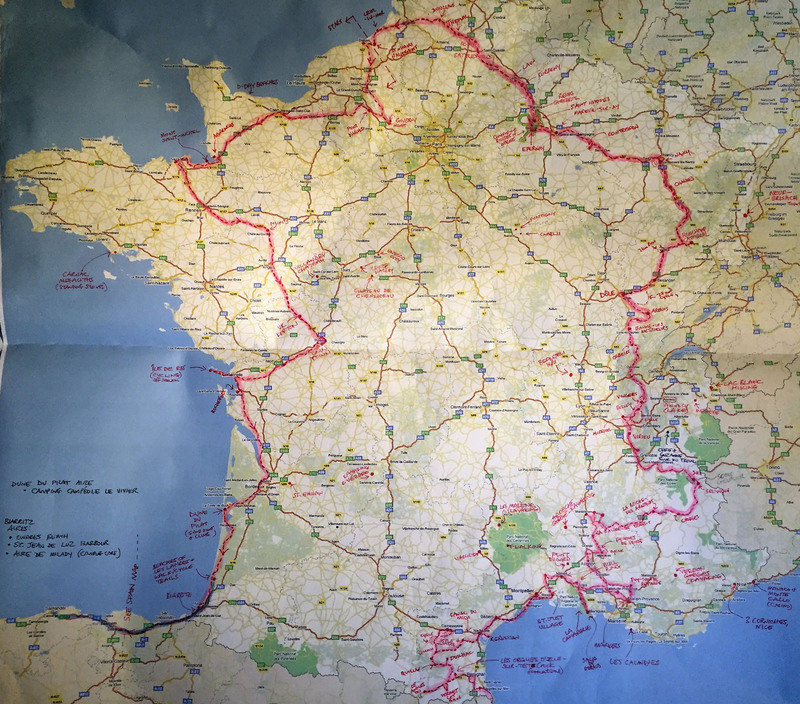 We visited a motorhome dealership to purchase a pigtail connection for French gas bottles, then bought an expensive Butagaz cylinder from a large Carrefour on the eastern side of the city. 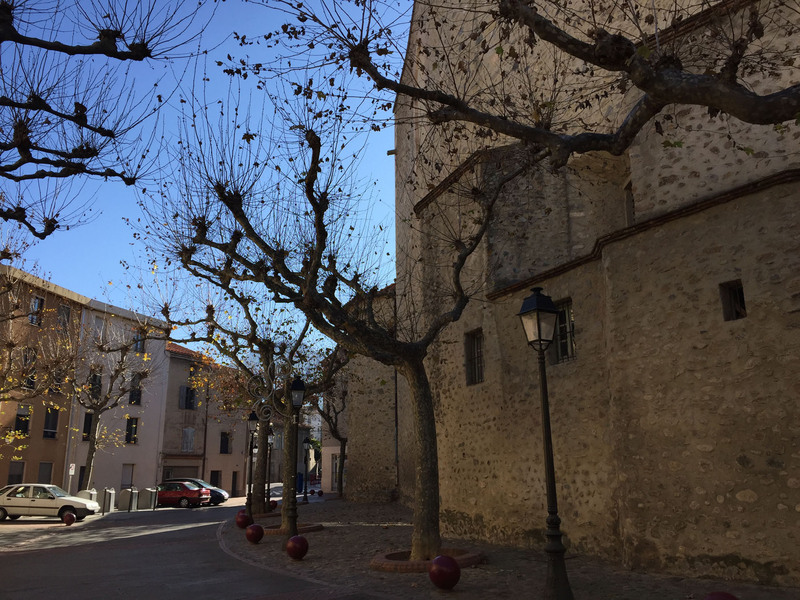 It proved difficult to find parking in or around the city, and after several futile attempts and with no actual knowledge at all of what Perpignan centre had to offer, we decided to push on rather than persevere. We have plans to be back in this area a lot in future, so skipping the city left some surprises for us to discover later. We took the road west out of the city and drove to the hub town of Prades, in the foothills of the Pyrenees. We parked on the side of a narrow road in town and walked to the centre, finding the main square with the town hall, pretty church and tourist office. Arriving during lunch, we slowly wandered around the local town streets until the tourist office reopened. 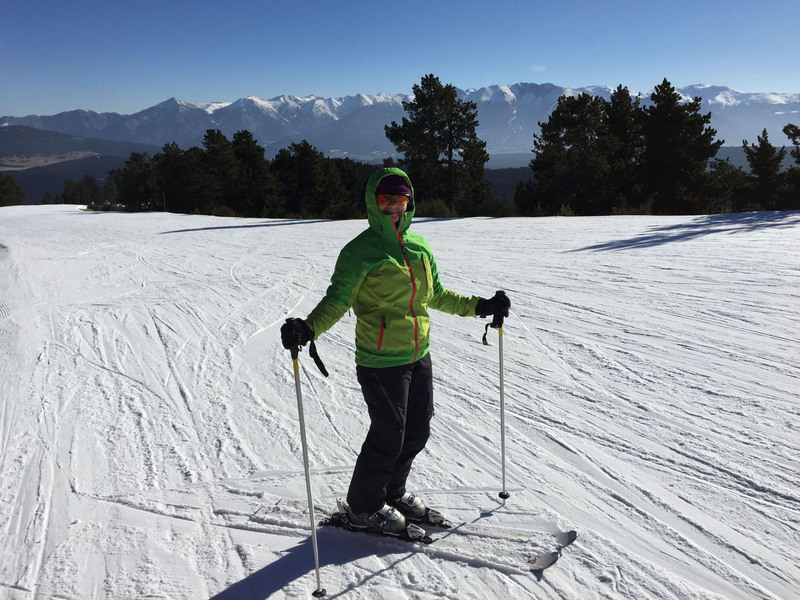 Here we received some good information on ski resorts and weather forecasts, and made a snap decision not to linger in Prades on the back of this. We had originally planned to overnight at Casteil, a local aire in the mountains south of Prades, but instead we pushed on up the winding mountain pass towards Mont-Louis and onwards, ever climbing, into the high mountains. 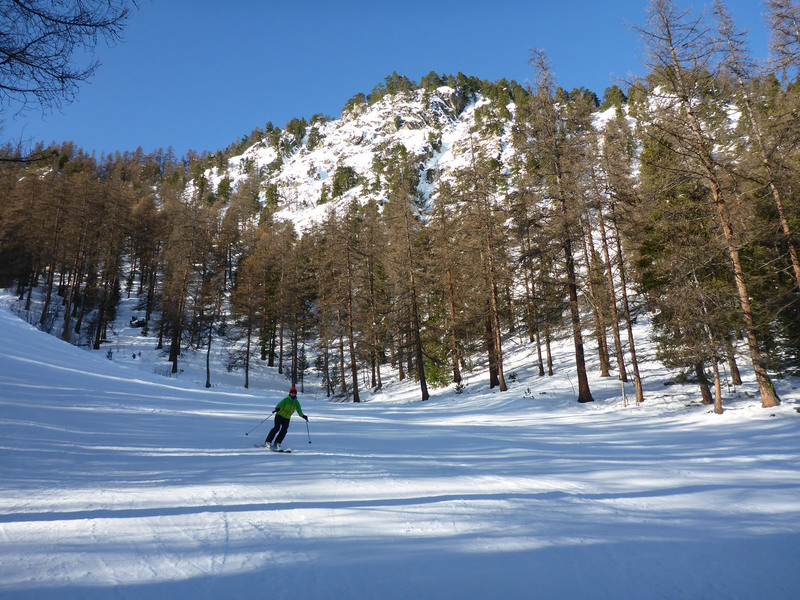 We picked the ski resort of Les Angles as our target destination, rather than the originally favoured Font Romeu. We arrived, through roads lined with snow, amazed to find the ski aire was (we thought) free and with electricity points available for all to utilise; signs suggested it would be payable soon. The aire sits at 1804m above sea level, most likely the highest we’ll be in on our travels. 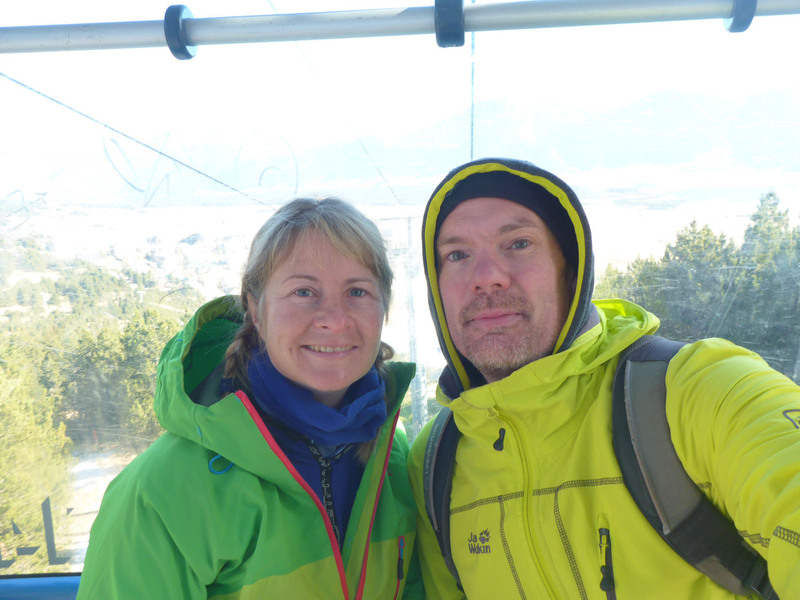 We were a little nervous to be at this altitude without first acquiring snow chains and shovels, but the tourist office in Prades had assured us there would be no snowfall until the following Monday or Tuesday at the latest, so we were content to trust this advice. We may well have been the only visitors in the ski resort who were hoping there would be no snow during their visit. We parked up in an empty bay, away from large mounds of ice and with great views of the slopes, settled in and ramped up our heating to fight off the high altitude chill. We awoke to a chilling -8 degrees outside, a little frightening but not exactly unexpected. Ignoring the free navettes, the ski buses that ran up and down from the aire and the adjacent ski lift to the town centre, we instead walked down the road into town, a distance of around 3km one way. 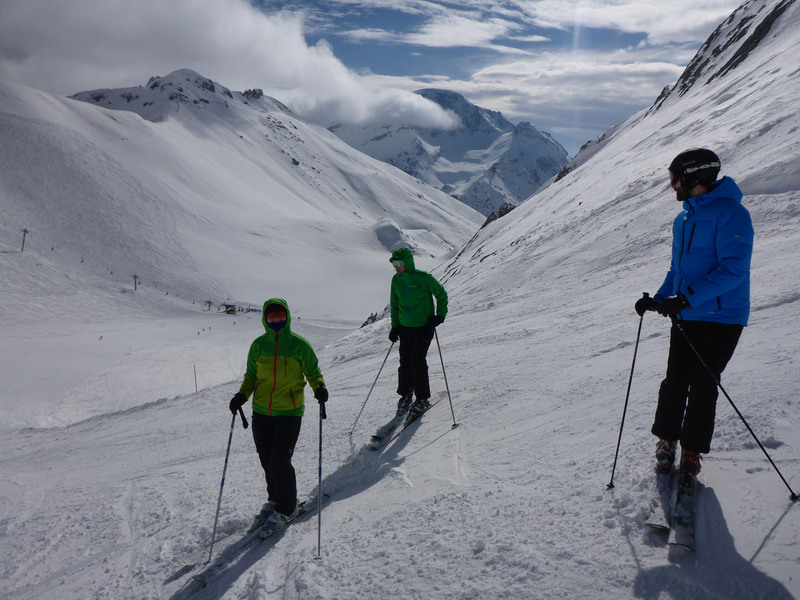 We explored the town a little, enjoying the very familiar feel of a high mountain ski resort, and scoped out the best prices for ski hire in anticipation of partaking the following day. We later walked back up the hill to our aire with a long baguette in hand, feeling very French. After awaking to a further cloudless day, the pink dawn light clipping the tips of the distant mountains, we decided that today was definitely a ski day. The early morning temperature was -14 degrees, the coldest we’d experienced, but we were still cosy inside Benny. We ate breakfast, dressed up warmly and readied ourselves for the pistes. We caught the first navette early morning down into the village centre, where we hired boots, poles and skis and walked, unsteadily in our ski boots, over to the main télécabine lift to begin. Here we bought our day lift passes and got on the empty gondola lift with slightly nervous anticipation. For various reasons we had not skied at all for three years, and it was four years since we had skied downhill, so we were not quite sure how our legs and skills would hold up. We need not have worried; a couple of shaky moments in the first run as we slowly warmed up were the only slight concern, and we soon got back into smooth turning and sliding, then settled in and enjoyed the views. The resort had had very little snow recently, so a good portion of the normal runs were closed. There were still a few natural slopes on the dark side of the mountain, but the majority of open pistes were formed from artificial snow. This gave the strange appearance of wide ribbons of snow snaking through areas of grass and trees, rather than the usually expected sight of a fully blanketed resort. The advantage was that the snow quality was very good, smooth and lightly powdered, with only some very small areas where a crispy ice top had formed. 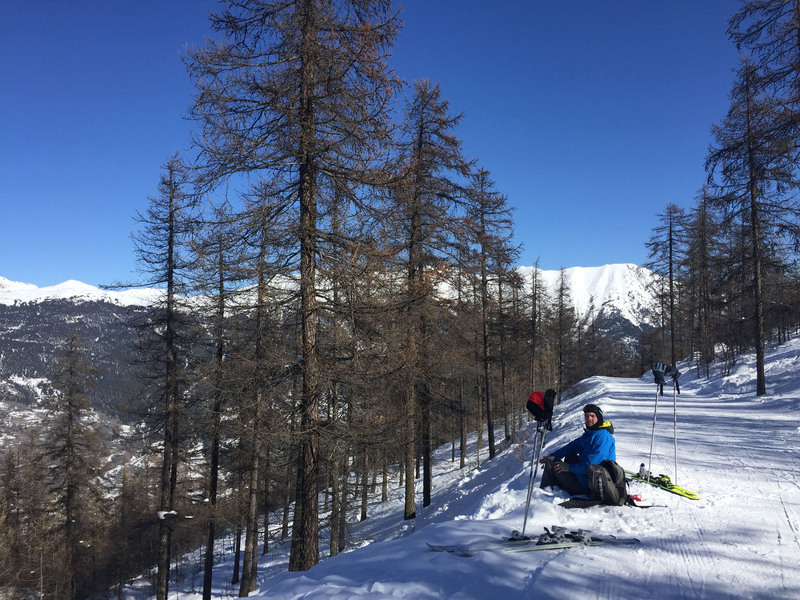 With only one day of skiing we thought we’d struggle to see all of the resort, but with some speedy descents and thoughtful planning, we skied every run that was open at least twice, some many more times, ensuring we experienced all that Les Angles had to offer us on this visit. Only once, with the lift momentarily stopped, did we have to wait to access a chair lift, and that was for no longer than a minute. All the pistes and lift queues were clear, so you could return to the top as fast as you could descend. We recorded a top speed of 57km/hr on our GPS tracking, not too shabby for shallow slopes that we were cruising purely for enjoyment. 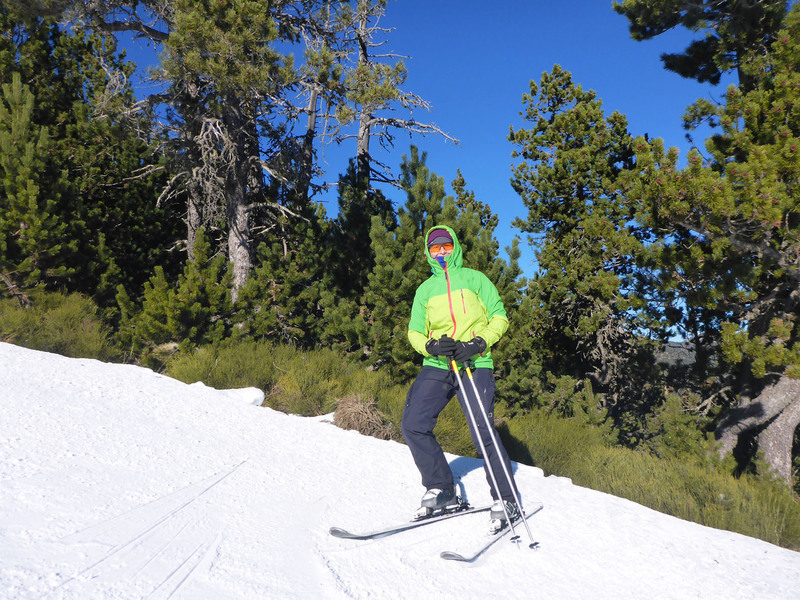 It was a fantastic day, and a great reminder that decent access to skiing areas remains a key priority for us. 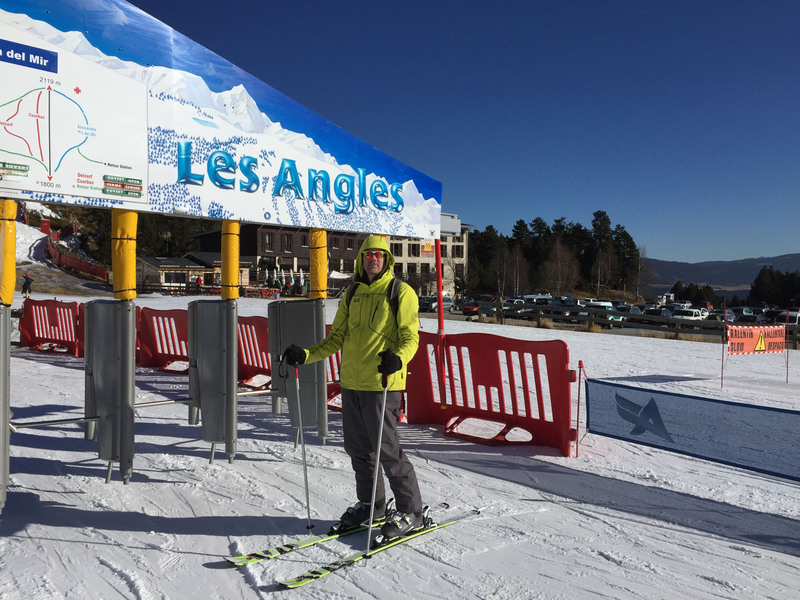 This entry was posted in Cycling, France, In France, Our Travel Journal, Skiing on Jan 22, 2017 by Aaron Hill.